Approximately 5 inches square, 125mm x 125mm. 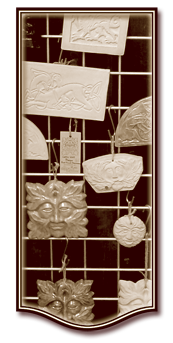 Stoneware - frost proof - suitable for hanging indoors or outdoors. Stoneware coloured with Iron Oxide mined locally in the Forest of Dean. Colouring may vary. 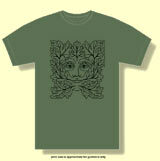 The Green Man can be seen throughout the country in many of the oldest churches. He can often be found looking down from high in the masonry onto the congregation below. The image was common through the whole of the Medieval period and in some ecclesiastical buildings - Canterbury Cathedral for example, they may be counted in the dozens. 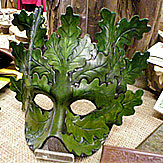 While the carvings date back to the middle ages, the application of the name “Green Man” is of more recent origin. In the 1930s, Lady Raglan visited the church of St. Jerome, Llangwm, Monmouthshire, where the Reverend J. Griffith drew her attention to the carved foliate heads in his church. 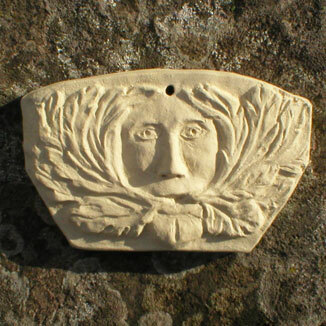 Lady Raglan wrote about these heads in an article for the Folklore Society. She titled her piece “The Green Man”. 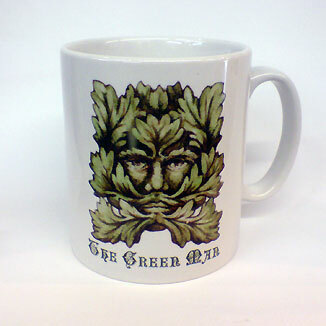 Recent years have witnessed a resurgence in interest in the Green Man. 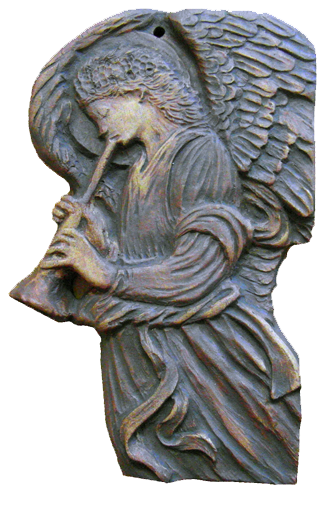 He is seen as a personification renewal and rebirth, he is the sprit of the natural world. The Red Dragon - Y Ddraig Goch - is the traditional emblem of the country of Wales. It is said to have been the battle standard of King Arthur and later was the badge of Henry Tudor, founder of the Tudor dynasty. In the year 1135, Geoffrey of Monmouth wrote the History of the Kings of Britain. In this book Merlin interprets a dream in which he says that the Red Dragon symbolises the Celtic peoples of the British Isles. Coloured with natural iron oxides mined locally in the Forest of Dean. Colours may vary. 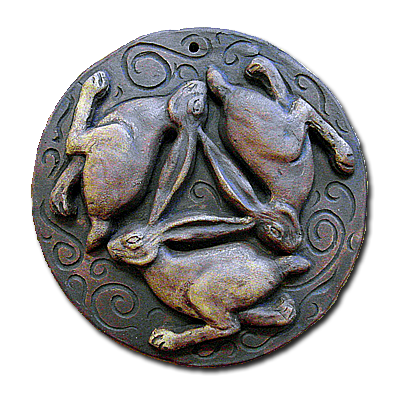 Three hares in a circle sharing three ears which form a triangle at the centre of the design. Sometimes they are known as “Tinners Hares” due the numbers to be found in Cornish Churches once frequented tin miners. 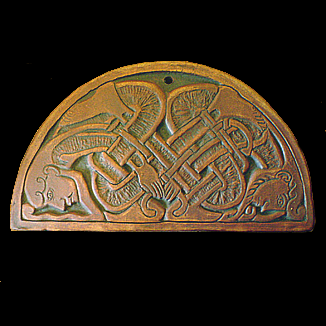 It has been suggested that in a Christian context they represent the Trinity, but a similar motif may be found across Europe and Asia in the religious art of Buddhism, Islam and Judaism. 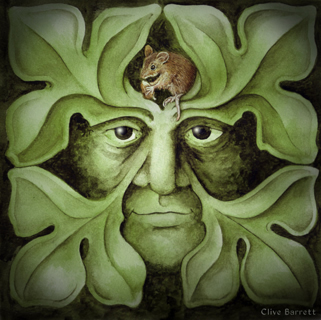 The hare is probably the most mysterious and enigmatic of all Britain’s animals. Secretive and seldom seen, it is a creature of dawn mists and the dimming twilight. 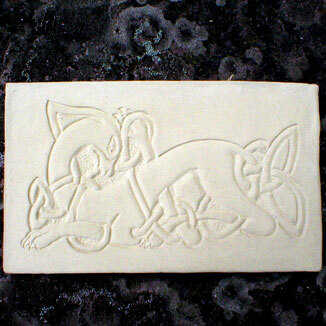 In folklore the hare symbolises the promise of new beginnings, growth and regeneration. 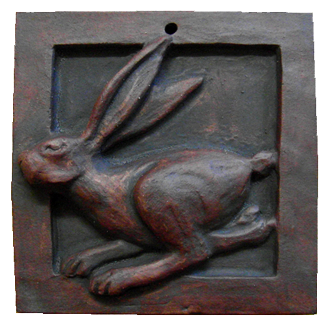 Traditionally, the hare is associated with the pre-Christian deity - Eostre. Bede, writing in the 8th century, tells us that Eosturmonath - April - was named after her and adds that Easter takes its name from the old pagan celebration. The Roman emperor Julius Caesar wrote about the Celtic worship of hares and tells that they kept them as pets. Later, in the middle ages, it was thought that hares seen boxing in the spring time were witches dancing. 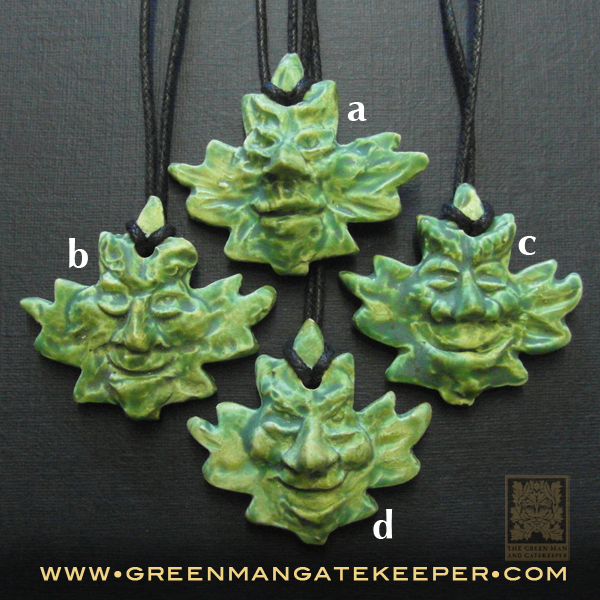 Stoneware - frost proof - suitable for hanging indoors or outdoors. Coloured with natural iron oxides mined locally at Clearwell Caves in the Forest of Dean. 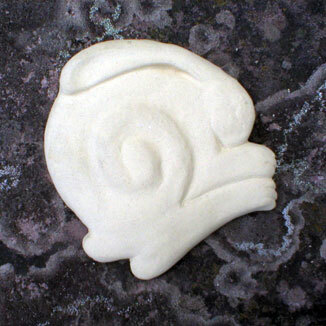 Approximate size 6.5 inches across. Based on a painting by Edward Burne Jones. 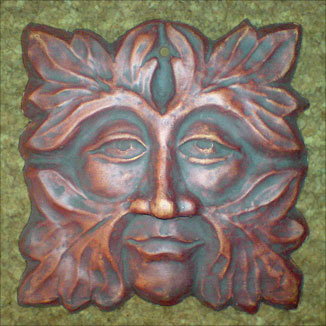 A range of ceramic wall plaques featuring the Green Man, Hares, Dragons and others. 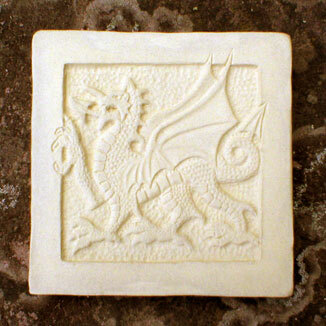 We chose to make our plaques from ceramic clay for a historical, environmental and practical reasons. Unlike modern materials - resin, concrete, reconstituted stone - fired clay sculpture is a truly ancient technique and goes back to the mists of time and, as any archaeologist will testify, it has the strength and durability to last for many thousands of years. The stoneware plaques are fired to a high temperature (above 1200 degrees) which makes them impervious to water and therefore frost proof. The earthenware plaques are glazed to add colour and also to protect them from the effects of the weather. Whilst being strong and durable, ceramic plaques have the advantage of being much less heavy than those made in other materials. This makes them suitable for hanging in places where a heavy plaque would be impractical. All our plaques are handmade. They are either one off unique sculptures or made from moulds based on an original sculpture. They are covered by international copyright. Making copies of these items is illegal. 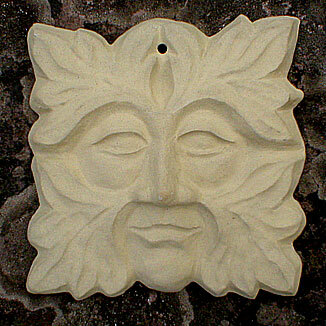 Should you wish to make your own green man plaques, moulds for concrete casting are readily available on ebay. While the clay is soft the reverse of each plaque is stamped with my initials. When fired this forms a permanent identifying mark of authenticity.